In the mid to late 1800’s a young elephant is captured in east Africa and transported to the European Continent. It is found to be mistreated in France and the London Zoological society comes to the rescue. The elephant grows to an enormous size, thirteen feet tall by most estimation’s and while on display at the London Zoo it is noticed by the one and only P.T. Barnum. He negotiates the sale which raises the hackles of Queen Victoria and the public in general. The animal is then crated and shipped off to the new world where its presence is enjoyed by millions of Circus patrons. 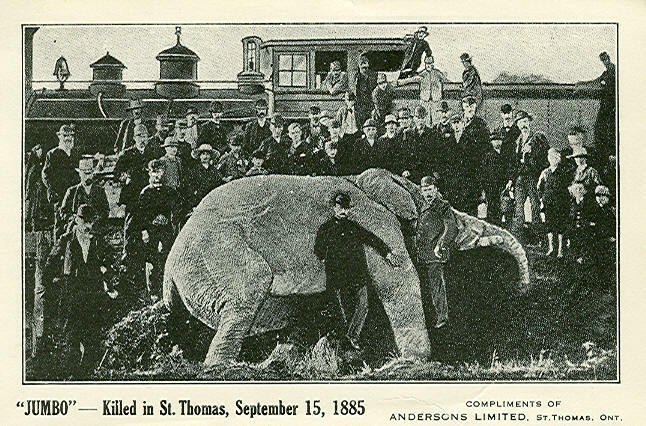 The circus tour schedule has Jumbo appearing in St. Thomas, Ontario in 1885. It is here poor Jumbo meets his demise in the form of a freak accident. He is run down by a freight train at night while returning to his quarters after an evening performance. The next morning a photograph is taken of the now deceased Jumbo lying inert nearby the train. In the photo, standing next to Jumbo is my great Grandfather to be. His name is Arthur Whittaker he is about twelve and this is the only photo I have found of him. It has been widely reported and recorded that Elephants have been known to paint pictures so there may be some connection from an artistic sense to this family encounter with Jumbo the Elephant? Just kidding of course, sometimes I can’t help myself. “Ron, I’m interested in what you’ve discovered. You know, I have been building our tree on Ancestry, let’s figure out how you can access the information and you can help me build on it. I do have information going back to 1650…. I can’t wait to hear what you’ve uncovered. I had an interesting experience last November. I took the train from D.C. to Philadelphia. Laura wanted to visit a friend before returning home, so we drove from the train to Newtown, PA. Her friend attends a boarding school in Newtown and while Laura was visiting, I explored the area. I had a strange experience as I drove the roads. It felt so familiar, as if I was home. I felt more at home than I do in L.A. Without sounding too woo-woo, it was as if I knew the streets. I knew our family was in Lancaster but Newtown is in Bucks County. In December I started again going through Dad’s papers and found a stack of information on our family tree, including information going back to the 1700’s, copy of articles etc. I discovered our ancestors settled Newtown! We have nearly 200 years of history in that town. There is even a street named after them. I also discovered our great great grandfather’s listed occupation was portrait artist. That information came from a mid 1800 census. “However, while the discovery of such “creativity genes” indicates that certain people may have a natural propensity for divergent thinking; this does not tell the whole story. A lot depends on how your genes are expressed and this is where the environment can play a defining role. There was an interesting twist, when in 1986 I met up with Harold Kuhn, my biological father. I discovered he had been an artist. Although he hadn’t been actively painting in recent years he had been engaged in the activity for extended periods during his lifetime and had an attic full of his art. It was an extensive body of work, there were framed and unframed oil paintings, with some in various stages of completion. As for myself, I have no idea how (or why) I became so engrossed with creating art during my own lifetime and why I pursued the formal education in the visual arts that I did? Neither of my adoptive parents were at all influential in steering me in that direction. Almost thirty years later, I find myself wondering why Harold and I had so many similarities in both our early lives and even much later. As a young boy Harold attended Tomlinson School, just a few blocks from where I grew up in Dearborn Township, Michigan. Obviously we physically resembled each other and we even shared identical handwriting. Plus, in 1986 we both lived in southern California just a few miles apart, and curiously we both had married girls from Arkansas at some point during our lives… interesting coincidence’s all. Sister Alyce’s information on the Kuhn Family of artist’s dating back to 1650 I found very interesting and it parallels my own investigation and instinct about how genetics may have played a role in my own interest in an artistic endeavor. It is still a lingering question for me personally? One Thomas Hilborn born in 1655 in North Petherton, Somerset, England a little more than a century or so after 1492 when, while in search of the spice trade with Japan, Christopher Columbus notably “Sailed the Blue” but discovered the New World instead. Mindful that ocean crossings in those days were not a sure thing, young Thomas, in 1670 at the ripe age of 15, indentured himself to a Quaker Missionary and bravely set sail from Bristol for Rhode Island. Shortly after arrival in the Providence Colony they were told Quakers were no longer allowed and so packed up and moved on to Newport. In 1675 Thomas became a Freeman and moved with other Quakers to Shrewsbury, New Jersey, where he lived with the Hooten family. Later, Thomas having married and now with six children, acquired land in Newtown Township, Bucks County, Pennsylvania. It was there he built his home, which I understand is still standing, and reportedly still owned by a descendant. The same Thomas Hilborn, a friend of William Penn, also served four terms in the Pennsylvania Assembly. He died in Newtown, but no grave stone has been located. Skipping ahead four generations of Hilborn’s, James, the son of Thomas IV, in 1802 moved his family (13 children) to Ontario, Canada. One of the offspring, yet another Thomas Hilborn(Jr.) b. 1815, had a daughter Sara Ann b.1845 that married Philip Johnson born in Berlin in 1843. One of the Johnson offspring, Julia Johnson b. 1863, is where the Kuhn family enters the picture. Julia married William C. Kuhn in Ontario in April of 1885. This William C. Kuhn, previously of Blair County, Pennsylvania, having immigrated to Canada for business purposes at age 20, would become my great grandfather. The union of William C Kuhn and Julia Johnson in 1885 produced 10 children, 7 girls and three boys. This family of Kuhn’s moved from Ontario to South Lyon, Michigan around 1899, where the greater part of their lives was spent. Their oldest son, William C. Kuhn b.1893, would become my grandfather. Of special interest to me, in the 1900 Lyon County census, great grandfather William’s occupation is listed as Artist! William C. Kuhn, the young, when in search of a bride apparently decided the pickings were much better across the river in Ontario. He found his bride there in the form of Mary Whittaker, the daughter of Arthur and Eliza Neugent Whittaker. William and Mary Whittaker were married in June of 1914. The Arthur Whittakers, according to records, were apparently descendants of Cromwellians that left Ireland during the 1845 famine re-settling in Grey County, Ontario. I have found documents relating to the “Whittaker Stove Works” located in the Windsor area in the 1890’s with Arthur Whittakers name referenced to it. It is the same Arthur Whittaker shown alongside Jumbo the Elephant in the photo above. In summary, on the paternal side, the earliest found records to date of Kuhn lineage (sometimes spelt Koon) are from several generations of Christian Kuhn’s, whose listed occupations include potters, artists and farmers are found in areas further west of Newtown centered around Altoona and Holidaysburg in Blair County. Sister Alyce and my origins on the maternal side, come after several generations of Thomas Wilborn’s that helped settle Newtown, Pennsylvania. Sara Ann, a fifth generation Wilborn, later married German born Philip Johnson in Ontario. Of their six children, Julia the oldest b.1863, marries William C. Kuhn in April of 1885. The oldest son of William C. Kuhn and Sarah Johnson Kuhn, is again named William C. and it is he who returns to Ontario to find his bride Mary Whittaker, the daughter of the same Arthur Whittaker, who as a twelve year old witnessed Jumbo the Elephants untimely demise. This latter William C. Kuhn would be our paternal Grandfather. I find the creative gene question still unanswered… far too many variables for my liking. JP… as usual you have lost me again. Asymptote??? Please return down to my level of comprehension.